Have you noticed over the last decade a dramatic drop in the number of birds and insects in your garden. The number of insect 'splats' on the car windscreen ? Then you are not the alone. During the last 50 years, agricultural intensification has caused many wild plant and animal species to go extinct and has profoundly changed the functioning of our ecosystems. Agricultural intensification has many components, enlarging field sizes by cutting down trees/hedgerows, larger inputs of fertilizer and in particular pesticides, resulting in loss of fauna and flora. How is it that a weed-killer used on cereal crops can increases pheasant/partridge chick mortality rates ? Partridge and Pheasant chicks between 2-3 weeks of age rely entirely on insects as the protein source for growth. An increase in the use of herbicides has been shown to be responsible for increased chick mortality due to lack of food (Sotherton et al., 1988; Hill, 1985). These insecticides are nicotine-based and act as a neurotoxin. They are systemic, the seeds are coated with this insecticide before planting and as the seed germinates the plant's vascular system distributes the insecticide to all parts of the plant ... stem, leaves, flower head and pollen and it stays there for the life of that plant. Unfortunately they do not discriminate between beneficial or pest insects ... any insect visiting this plant is DEAD. I mean, it is an insecticide and that is what it was desiged to do, right ? ... have their seeds coated with this group of insecticides. These insecticides remain in the food you eat and they remain in the ground, some having a half life of up to NINETEEN years depending on soil type. They are highly mobile in the soil, water soluble, highly toxic to aquatic life and are accumulative. It has been assumed by regulators, and by toxicologists in general for that matter, that a safe level of exposure could be defined for any class of compound, except for chemical carcinogens. We have known for nearly half a century that a single molecule of a chemical carcinogen can cause a mutation (in DNA) that ultimately leads to cancer. But now it turns out that there are insecticides, such as neonicotinoids, or metallic compounds, such as selenium that are just as dangerous as chemical carcinogens, and the chances are many other chemicals polluting the environment could be similarly hazardous. We simply don't know because it was never properly investigated. The common feature of these dangerous compounds is that they bind irreversibly to (block) critical receptors (a receptor is a molecule which receives specific chemical signals; these signals tell a cell to do something—for example to divide or die, or to allow certain molecules to enter or exit the cell). As a result, toxicity becomes a process that takes place in time. With every exposure to these dangerous chemicals, more receptors are blocked, until the damage is unsustainable and death ensues. So even the tiniest amounts of these chemicals are hazardous. One exposure to 1000 units is equivalent to 1000 exposures to 1 unit. 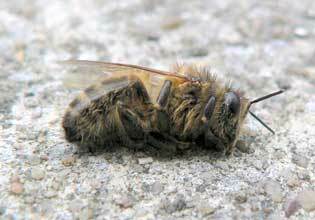 There are two crucial (and catastrophic) disadvantages of the neonicotinoid insecticides. They cause damage to the central nervous system of insects that is virtually irreversible and cumulative. There is no safe level of exposure, and even minute quantities can have devastating effects in the long term. They leach into groundwater and contaminate surface water and persist in soil and water, chronically exposing aquatic and terrestrial organisms to these insecticides. So, what, in effect, is happening is that these insecticides are creating a toxic landscape, in which many beneficial organisms are killed off. 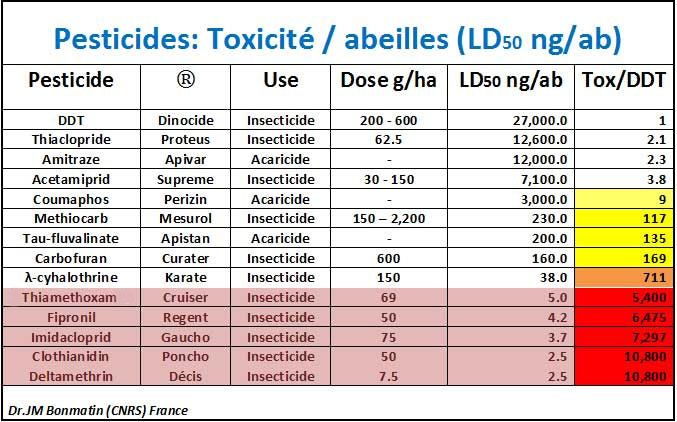 Below is a table of some of the commonly used pesticides ... their toxicity is compared to DDT which was banned in Germany and the USA in 1972 but not in the United Kingdom until 1984. The corporations are calling the shots. They have used their money and influence to take over every aspect of society that might bear on the success of their objectives. They have control of the government, the judiciary, the legislative system, the science, the regulatory system, the media. The main stream media is simply the house organ, and any articles that have appeared have attempted to spin the story away from pesticides. There is mounting evidence that this class of pesticide should be removed from the market ... I have compiled a list below of some of the scientific data to support this argument. The list is nowhere complete ... if you have any files to add please let me have them. Are neonicotinoids killing birds ?